Avatar is without a doubt a great film and I'm clearly not alone in that opinion, since it's release in 2009 it has become the highest grossing film of all time and the first to pass $2 billion in sales. It was nominated for a total of 9 Academy Awards and won "Best Cinematography", "Best Visual Effects" and "Best Art Direction". Part of this success has to be due to the fact that it was ground-breaking, the first film created in the new 3D technology and love it or loath it there is no denying the impact this technology has made on the Cinema. I personally loved the film, a visual tour-de-force even if it was a little OTT on the preaching and had more than it's fair share of cheese. The story itself is loosely based on - or at the very least inspired by - the Ursula K Le Guin novel The Word for World is Forest although I don't think Cameron would ever admit to this. There is a lot of interesting future tech on display too, combining the older style "Mech Robots" with their more advanced organic Avatar along with a myriad variety of alien flora and fauna. As a result it's perhaps unsuprising that this book was made to give some explanations and guidance, casting light on how feasible things like anti-gravity "unobtainium" (a cringe-worthy name if ever there was one and one that almost made me pack up my dinosaurs and leave) really is and just how a symbiosis between plants and animals could be possible. The best choice of author to write this book had to be Stephen Baxter, his ability to look at the big picture and write about science in an easy to understand manner is almost unmatched. 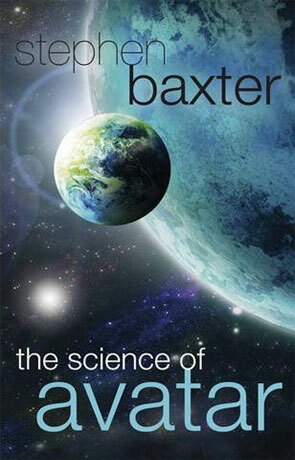 Managing to capture the imagination, Baxter has created a richly detailed book that should appeal to any fan of hard science fiction or indeed anyone who's interested in science itself. It's clear that the author has gone to a great deal of trouble not only researching the science but getting to know Cameron's creation inside out too and the book has sections that describes scenes and characters from the film, providing a great deal of context where required. The science is handled brilliantly and is pretty far reaching too, from quantum entanglement and relativity to time-dilation and eco-apocalypse there is something here for everyone. I actually learned a few things too, not least the fact that Pandora is located in the nearby binary star system of Alpha Centuri - only 1.34 parsecs away from our Sun and visible as the brightest star in the southern constellation of Centaurus. It's clear that although some of the things about Pandora are clearly flights of fancy (floating mountains!) but the author does an admirable job of avoiding outright derision and instead concentrates on the real possible science, of which there is a surprising amount. For anyone interested in science or even budding scifi writers, "The Science of Avatar" is a worthy purchase written by a talented author and packed full of engaging explanations. Written on 23rd July 2012 by Ant.